If you find advertisements that are sent to you from irapidseek.com, it is a sign that your Internet browsers are affected by some adware program. The server irapidseek.com hosts various pop-up advertisements, which can be sent to your browsers when browsing various websites, including commercial and non-commercial websites. If you find suspicious pop-ups that are sent from irapidseek.com, it is advisable to implement a powerful spyware removal tool. Google Chrome has blocked access o irapidseek.com. This website has been reported as a phishing website. The advertising server irapidseek.com may be used by numerous adware programs and adware helpers. One of the adware helpers is available at stat.irapidseek.com/installers/ and is signed by Denco Limited, which is also associated with the adware program FastFreeConverter. The adware helper installs two system servers, one of which updates the adware program, while the other one is responsible for displaying pop-up advertisements. The files connect to free-for-now.com and free-updater-now.com. Irapidseek.com pop-ups belong to those websites to which you are taken, which means that you interact with pop-up advertisements at your own risk. There are many free browser extensions displaying coupons, web banners, and other advertisements. The developers of those programs do not endorse the third parties advertised, which means that various deceptive advertisements may be sent to your Internet browsers. Moreover, you should keep in mind that adware programs may also monitor your online behavior. They record search terms, clicks, browsing history, browser type, browser language, and other non-personally identifiable information. When you are provide with irapidseek.com, it is very likely that some adware program is present on your PC. The adware helper displaying irapidseek.com advertisements has to be removed separately because the removal of the adware program may be inefficient. Unfortunately, the Control Panel will not help you remove the unwanted file because you have to find the location of the file uninst.exe and execute it. 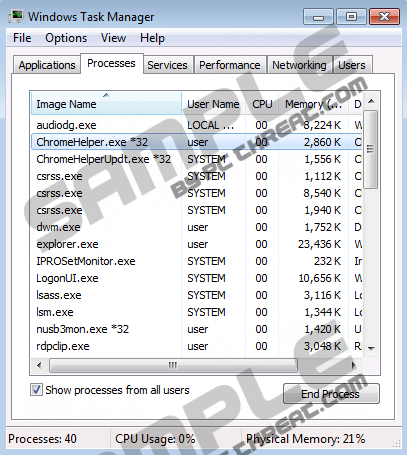 In order to find the file, go to C:\Program Files (x86)\Common Files\ChromeHelper. If you do not want to waste your time trying to remove the adware program and the file related to irapidseek.com pop-ups, implement SpyHunter. This real time security program can easily detect and remove adware helpers, adware programs, browser hijackers, rogue security programs, Trojan horses and many other threats. Quick & tested solution for irapidseek.com removal.